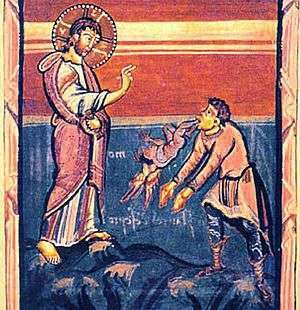 The exorcism of the Gerasene demoniac, frequently known as the Miracle of the (Gadarene) Swine, is one of the miracles attributed to Jesus in the New Testament. 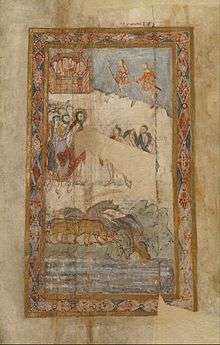 The story shows Jesus exorcising demons out of a man and into a herd of swine, causing the swine to run down a hill into a lake and drown themselves. The story appears in the three Synoptic Gospels, but not the Gospel of John. All accounts involve Jesus exorcising demons, identified collectively in the Mark and Luke narratives as "Legion". The story was interpreted by Church Fathers including Saints Augustine of Hippo and Thomas Aquinas to mean that Christians have no duties to animals. It has been a point of contention in discussions of Christianity and animal rights. The earliest account is from the Gospel of Mark (Mark 5:1-20), in which Jesus goes across the lake to the "country of the Gerasenes", that is: the territory of the city-state of Gerasa. There, a man "possessed by a demon" comes from the caves to meet him. People had tried to tie him down but he was too strong to be bound, even with chains for he would always break out of them; night and day among the tombs and in the hills he would cry out and cut himself with stones. Jesus approaches and calls the demon to come out of the man, who replies "What do you want with me, Jesus, Son of the Most High God? I beg you in the name of God never to torment me!" Jesus asks the demon for his name and is told "My name is Legion, for we are many." The demons beg Jesus not to send them away, but instead to send them into the pigs on a nearby hillside, which he does. The herd, about two thousand in number, rush down the steep bank into the lake and are drowned. The man is now seen, dressed and restored to sanity. The Lucan gospel version (Luke 8:26-39) shortened this but retained most of the details. The author of the Matthew Gospel shortens the story more dramatically (Matthew 8:28-34) and writes not of one possessed man, but of two. 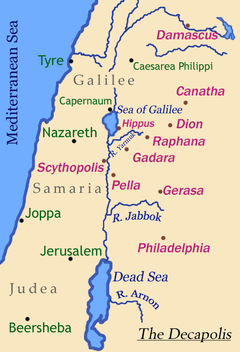 The location is also changed, from the territory of the Gerasenes to that of the Gadarenes (Gadara). In this version, Jesus does not ask for the demon's name – an important element of traditional exorcism practice. Christ himself shows that to refrain from the killing of animals and the destroying of plants is the height of superstition, for judging that there are no common rights between us and the beasts and trees, he sent the devils into a herd of swine and with a curse withered the tree on which he found no fruit. Similarly, Thomas Aquinas argued that Jesus allowed the demons to destroy the pigs in order to make the point that his purpose was primarily for the good of men's souls, not their bodies or property (including their animals). This interpretation has been shared by a long line of commentators up to the present day, including I. Howard Marshall and Mark Driscoll. However, other commentators have attempted to make the story consistent with a Jesus who shows "care and concern for animals," as John Austin Baker wrote. Such alternative readings include arguments that the swine were meant to represent the Roman army or "unclean and unfaithful" people; that pigs were considered "unclean", so destroying them might be consistent with care for other animals; and that Jesus did not actually "send" the devils into the pigs. The story has also been cited by critics of Christianity as demonstrating a supposed moral flaw in Jesus. Such critics include the philosophers Peter Singer and Bertrand Russell; in a pamphlet titled Why I Am Not a Christian, Russell wrote, "it certainly was not very kind to the pigs to put the devils into them and make them rush down the hill into the sea. You must remember that He was omnipotent, and He could have made the devils simply go away; but He chose to send them into the pigs." The story appears to be set close to the Sea of Galilee, but neither Gadara nor Gerasa is nearby; both cities are southeast of the lake, Gadara 10km away or a three-hour walking distance, and Gerasa well over twice as far. Origen speculated that there had been a town called "Gergasa" on the shores of the Sea. The differing geographical references to Gadara and Gerasa can be understood in light of the social, economic, and political influence each city exerted over the region. In this light, Matthew identified the exorcism with the local center of power, Gadara, located about ten kilometres southeast of Lake Galilee, whereas Mark identified the event with the regional center of power, Gerasa, located further inland. The city of Gerasa had been a major urban center since its founding and during the Roman period it was the more widely known among the ten-city league known as the Decapolis. Who eat swine’s flesh, and the broth of abominable things is in their vessel". The story is the origin of the English proverbial adjective Gadarene, meaning "involving or engaged in a headlong or potentially disastrous rush to do something". 1 2 Honderich, T. (2005). The Oxford Companion to Philosophy. Oxford Companions. p. 37. ISBN 978-0-19-926479-7. 1 2 3 4 5 6 Spalde, Annika; Strindlund, Pelle (2012). "Doesn't Jesus Treat Animals as Property?". In York, T.; Alexis-Baker, A.; Bekoff, M.; McLaren, B. A Faith Embracing All Creatures: Addressing Commonly Asked Questions about Christian Care for Animals. Peaceable Kingdom Series. Wipf & Stock Publishers. p. 102. ISBN 978-1-61097-701-2. 1 2 Donald Senior, What are They Saying about Matthew? (Paulist Press, 1996) page 84. ↑ Craig S. Keener, A Commentary on the Gospel of Matthew (Wm. B. Eerdmans Publishing, 1999) page 282. 1 2 Preece, R.; Chamberlain, L. (2010). Animal Welfare and Human Values. Wilfrid Laurier University Press. p. 16. ISBN 978-1-55458-767-4. 1 2 3 Linzey, A. (2016). Christianity and the Rights of Animals. Wipf & Stock Publishers. p. 48. ISBN 978-1-4982-9195-8. ↑ M. Eugene Boring, Mark: A Commentary (Presbyterian Publishing Corp, 2006) pages 148–149. ↑ McArthur, Dr. John (1987). Matthew 8-15. MacArthur New Testament Commentary. The Moody Bible Institute of Chicago. p. 41. ISBN 0-8024-0763-3. ↑ Brown, Raymond E. et al., The Jerome Biblical Commentary, Englewood Cliffs, New Jersey: Prentice–Hall Inc., 1968, p. 32.